Adam Creighton is a video game industry leader, and a professional voice, film, and commercial actor, living a life of desperate creativity. Originally from Idaho (giving him a predilection for all things potato, a fascination with tall buildings, and a useful lack of accent), Adam now lives in and is deeply rooted in the Austin acting and buiness startup scene, does frequent gigs on the East and West Coasts, has a voice that travels the world, and his heart is firmly rooted in the entertainment industry. Acting style? Call it Being. Not pretending. Not about being hokey -- just authentic in-character and out. Business style? Collaborative, ethical, and aspirational, where those things are more than just words, and contribute directly to commercially successful companies with incredibly postiive cultures. Adam is currently represented by Collier Talent Agency in the central United States, and is currently acting as an independent in all other regions. Adam records voice work from his home studio, and through partnerships with national and regional studios. 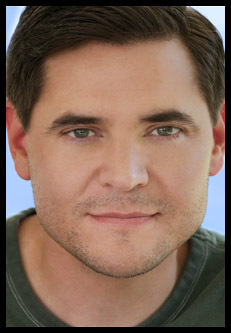 Check out Adam's acting resume, and be sure to watch and listen to his online video clips and voice demos. You can check out Adam's video game rap sheet here.